Collingwood's Steele Sidebottom celebrates a goal while Brendon Goddard looks on. Picture: Alex Coppel. 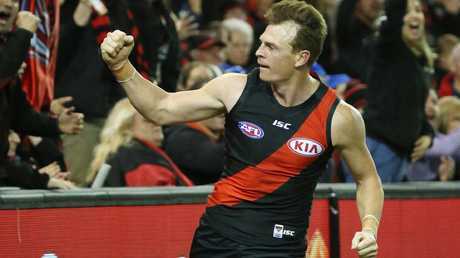 Newly-retired AFL great Brendon Goddard has hosed down expectation on Essendon in 2019, believing the Bombers are still at least a couple of years away from seriously challenging. 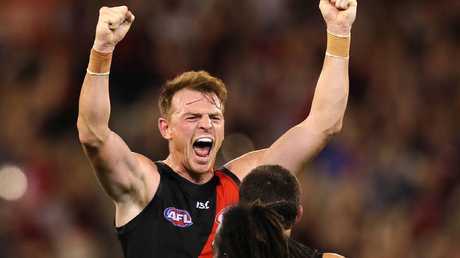 Goddard, who forged his name at St Kilda before ending playing his final six seasons in the red and black, officially retired last week having taken time to assess his options after playing his final match at Essendon. 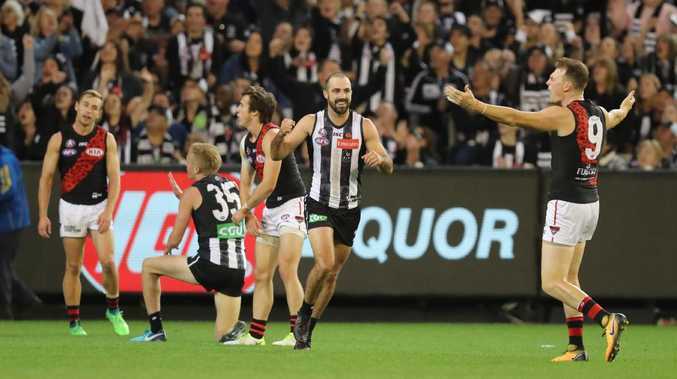 Many experts think the Bombers could be the bolter in 2019, with the addition of Dylan Shiel and injury return of Joe Daniher set to bolster a team that this year showed it could match it with the AFL's best. There is plenty of hype around the Bombers but Goddard has cautioned against expecting too much from the team that missed the finals in 2018. "Yeah probably not this year, to be honest." Goddard said when asked if he was as bullish as some experts. "I think they're in the bottom four in terms of age of list in the AFL. 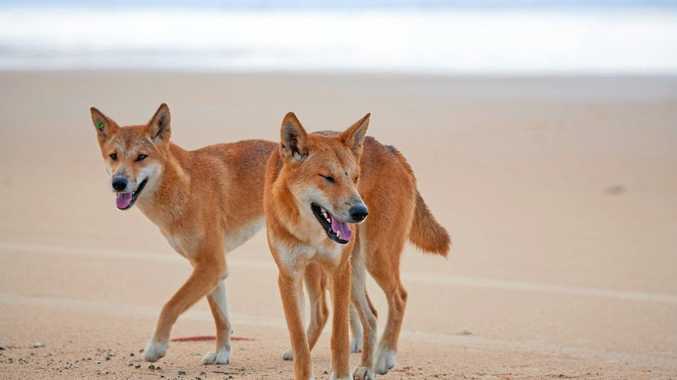 It's just a matter of now playing together. "If you look at the great teams of the past where they've had sustained success ... even the teams that have challenged for so long without the ultimate success, they've actually spent three, four, five years playing under the same coach and the same system before that actually starts to see the results. "Woosha's only really had a clean slate and the group's only really had a clean slate for two years now." Goddard said the Bombers' time would come. "We all wish and hope it'll be this year but I really see 2020, 2021, '22, Essendon definitely has the list to really challenge and compete and have sustained success - not only for three years but for the next five or six," he said. "Definitely in the next six to eight years I see Essendon being a pretty dominant footy team and club." Brendon Goddard has no regrets from his time at the Saints despite not quite being satisfied from his time in the game. The 334-game veteran's best chance of premiership glory came with the Saints when his team fell just shy in both the 2009 and 2010 grand finals - deprived by a freakish Matthew Scarlett toe-poke and the bounce of the ball the following year. 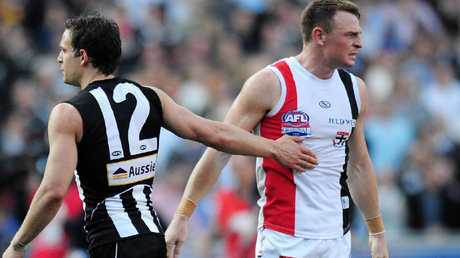 Goddard's massive hanger in the 2010 drawn grand final with Collingwood is an iconic moment from the thrilling draw. "Just talking about it (his 2010 hanger in drawn grand final) I still get tingles," he said. "I always had that hope while playing of winning premierships ... but now that it's all finished up, it's not that I'm unfulfilled, but I'm just not quite satisfied." Goddard took a huge grab in the final quarter and put the Saints in front. Despite the heartache of just falling short, Goddard said those St Kilda teams remained close and caught up each year to celebrate their achievements. "The moments we shared as a group through that 2009, 2010 (period), we deem ourselves to be successful," Goddard said. "We still catch up now every year, prelim final week. It's not the premiership team it's the losing grand final team who still catch up because we still feel that we were very successful without actually winning the medal and the cup." Goddard said the memories of that period were the "most important things", and while failing to grace the dais the Saints were closer because of those times. Former teammate Luke Ball understood Goddard’s pain after the Pies won the grand final replay. "We used to talk about what it could've, or should've or would feel like being premiership teammates, but we've kind of come up with the conclusion that it kind of would've sealed the bond between us and just added a little cherry on top of what we already do have," he said. "We feel like we've missed out on a lot in the whole scheme of things because we're not premiership players but at the same time, if it makes sense, we feel like we haven't missed out on a lot because we still share that bond as if are premiership teammates because of what we went through and the unique circumstances of playing in two grand finals in the space of two weeks and all that kind of stuff. "I'm pretty satisfied with everything else and don't have any regrets." 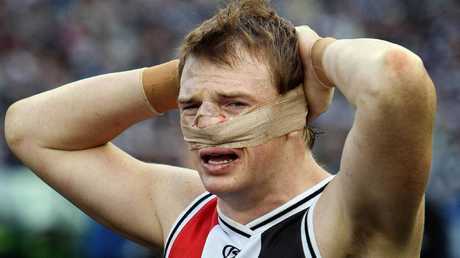 An emotional Goddard after the 2009 loss to Geelong.